ps. I’m beginning to think we shouldn’t have thrown away that key. There’s no food in here…..
And as we sit in the office at 9pm on Monday, there actually isn’t any food in here. 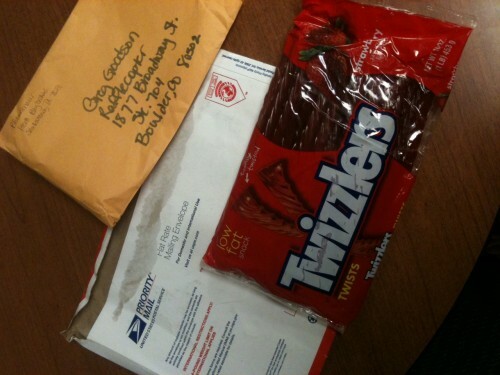 But Debi Pritzenmaier was kind enough to send us some Twizzlers that we can munch on. This is our way of sending thanks – a blog post. Now I want some Twizzlers! Haven’t had them in such a long time! Sorry you’ve run out of food. Just stopped by to tell y’all how much I LOVE using Rafflecopter. Y’ll have made my life so much easier! So THAT is how she got an invite. That Debi, she is a crafty one.